This recipe is called easy~peasy because you can prepare it when you need it or the night before. Because it is oven baked it is mess free and doesn’t require you to stand over a hot stove. Simply line an oven proof dish with baking paper, pop it in the oven and tada, breakfast is ready to serve. 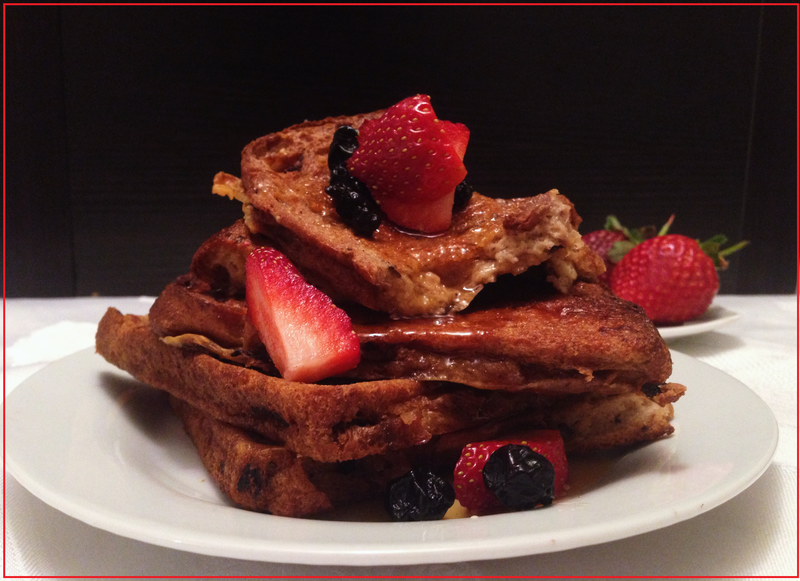 Simple and delicious oven baked French toast, served with lashings of maple syrup and berries. Preheat oven to 180C. Line an oven proof dish with baking paper. In a large bowl, beat eggs, add milk, cream, cinnamon, icing sugar and vanilla. Place each slice of toast into the bowl, and allow to sit for a few seconds to soak up some of the egg mixture. Repeat with all 4 slices. Place bread onto oven proof dish with baking paper. If cooking the following morning, cover with glad wrap and place in fridge. If cooking straight away pop straight into the oven for 20minutes or until golden. This recipe can easily be multiplied to produce breakfast for a large crowd.